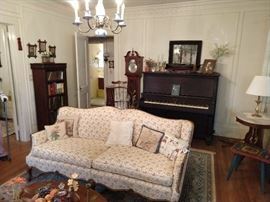 Jewel Box 1929 Home in Marietta, Historic Whitlock Ave., Full O' Treasure! 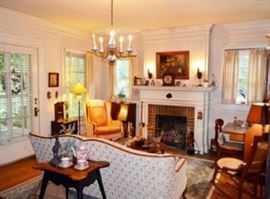 Warm and cozy living room, with vintage Frenchy sofa, rocking chairs a-plenty, old lady floor and table lamps and fun for the whole family! 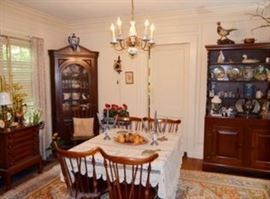 Lovely and bright dining room, with 1940's mahogany things. Vintage cherry hutch. It even has slots for your sterling spoon collection. Those crafty Amish, they think of everything! 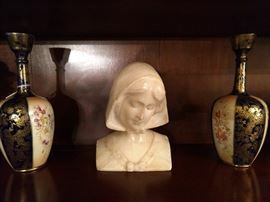 Pair of Asian hand painted vases and vintage white marble female bust. 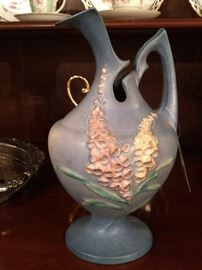 Wonderful color Roseville Blue Foxglove ewer, 5-10. Even YOU would look good in this mirror! ;-) Vintage gilt wood, in excellent condition. Vintage wooden mantle clock, pair of Italian hand painted vases, with cranes and a pair of marble and brass 5-light candelabras. Doesn't that sofa just draw you in? That and a good bang on the piano will make for a lovely, relaxing weekend. Vintage Wellington mahogany upright piano. Includes the bench. We are so very generous! 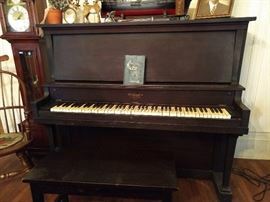 The serial number on this piano (244621) dates it at 95 years old, manufactured between 1923-1924. The soundboard states "The Cable Company, Chicago". One of three vintage cedar chests in this house. 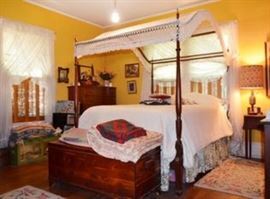 A very nice, vintage four poster mahogany bed, with hand-crocheted canopy. The bed was made by Biggs Furniture Co., Richmond, VA. Antique 4-drawer dresser, in cherry and pine woods. 1940's mahogany desk (by Bigg's Furniture Co., Richmond, VA) salesman's sample mahogany dresser, vintage oak wall clock. 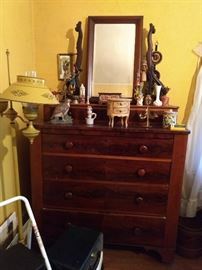 A better picture of the children's 3-drawer dresser, with ghosty mirror; if you squint, it could be a salesman's sample. Vintage Afghan Baluch runner, hand woven, 100% wool face, measures 6' 9" x 2' 1". Hey look! Another Victorian, marble-topped oval side table. Wonderful 1940's mahogany 5-drawer chest in pristine condition; manufactured by Biggs Furniture Co., Richmond, VA. The three matted and framed pics are vintage regional German dress, worn by Deutsche Divas, strutting the Rhine runway. Beautiful vintage hand painted porcelain vase, with gold gilt detail. Just look at these randy Germans, sporting lederhosen and big ol' guns! The local lady talent is digging it. The edelweiss border is the sheisse! Two-drawer vintage mahogany gentleman's shaving mirror. 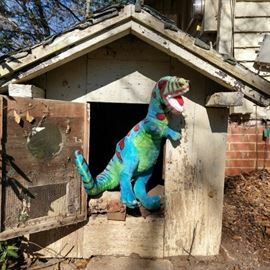 THIS is a rare find indeed! An original oil painting, on canvas, by 19th century American artist W. P. Brickwedel. Google search yielded a recent auction result, April 2008 at Cowan's Auctions, for $8,050.00! Here he is, hard at work, trimming his medicinal herb vine. Vintage Persian Hamadan rug, hand woven, 100% wool face, measures 6' 3" x 4' 3". Victorian burled wood 3-drawer dry sink, with white marble top. This has a pull-out rod on the right side for towels. Vintage oak wall clock, vintage Shaker style single drawer cherry side table. Vintage Persian Veramin runner, hand woven, 100% wool face, measures 9' 11" x 3' 11". Guten tag! That's what this lovely, vintage cuckoo clock would like to say! Vintage Singer sewing machine, motor number 4258082, with wooden carrying case; Simanco, USA. Another of the vintage cedar chests. 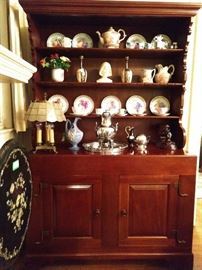 LOVE this antique cherry corner cabinet. The patina on the wood is perfect. Check out the rear on this hottie! Not made in China yesterday, nor something you can run out to IKEA to purchase. Nice Victorian 3-drawer marble-topped dresser, with matching adjustable mirror. 1960's hand woven Persian Heriz rug, measures 8' 3" x 10' 2". Don't ask, because the lovely window treatments are not for sale! Nice vintage full size mahogany four poster bed, made by the Bigg's Furniture Co., Richmond, VA, and another of the vintage cedar chests. Rockers, rockers, everywhere! What is is about older people and rocking chairs. Must be something they put in the suggestive advertising at Cracker Barrel, or is it the potatoes? Yes, another vintage cedar chest. Lovely collection of sterling silver nut dishes, card holders, cigarette holders and set of nine goblets; tray is silverplated. I know, disappointing. 12" long sterling silver punch ladle, by some little known NY company, named Tiffany. This is their "Palm" pattern. Vintage Baker Biedermeier-ish octagonal dining table , with two leaves (each 2' wide) and six chairs - two arm, four side. Top view of the Baker dining table - great veneer! Vintage French Empire mahogany/ ebony side table. Top view of the French Empire table. 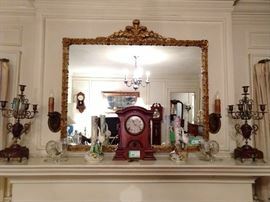 LOVE this fancy-schmancy gilt wood framed mirror, surrounded with crimson glass. Bohemian milk & ruby glass lustre lamp and a pair of vintage brass & porcelain candleholders. 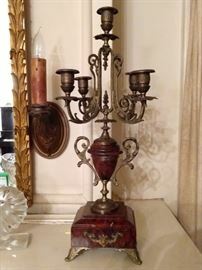 Lovely pair of French 2-light bronze girandoles.